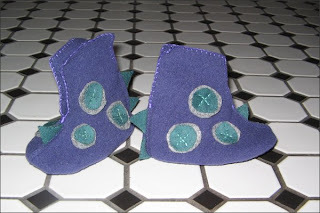 I made another pair of booties - the first two pairs were for 0-3 months. This time I did a pair for 3-6 months. I also added a rubber sole just in case. 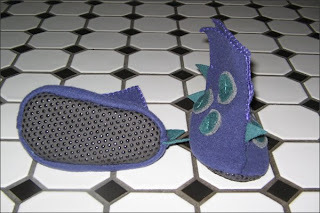 I used Heather Bailey's Bitty Booties pattern but made some modifications - I wanted something a bit more funsie. They are definitely purple people eater booties. Hopefully my friend Anita will like them!